Do you need to erase your Kik history from iPhone fast? Are there conversations that you’d rather people not see? This is often the story with apps like these; they can really be problematic for your privacy. Luckily, there are ways to delete your conversation history—but is manually deleting them enough? Why You Should Delete Your Kik History? Look, you never know when your iPhone is going to get lost or stolen. You also never know when someone you know might snoop through your things. If you delete your Kik history, you ensure that know one will ever know what you talked about. Save you a lot of space on your iPhone, especially if you tend to send attachments. Protect your from privacy breeches. But note that, the different ways you choose to delete Kik conversation history will cause different results. I means deleted Kik messages can be recoverable and no longer recoverable if you apply different ways. Step 1: Open up the Kik app on your iPhone. You will see all the contacts which you communicated. Step 2: Find the specific conversation you want to delete, and swipe it to the left. Step 3: Tap the red Delete button at the right side. The conversation will be deleted. You can also delete all of your Kik conversations history from iPhone. Step 1: Open up Kik on iPhone. Step 2: Go into Settings tab and tap on Your Account. Step 3: At the bottom, tap “Logout”. Step 4: Confirm by tapping Yes from the pop-up window. The whole conversation history will be removed from your Kik app. As mentioned above, manually deleting in the ways described above aren’t the best way, though. You see, the problem is that manually deleting data on your iPhone doesn’t really remove it. When you “delete” messages, files, and other information on your iPhone, it’s not immediately erased. It’s simply marked to be overwritten and removed from view. This way, it seems like it has been removed, but it won’t be until iOS decides to overwrite it. The obvious problem with that is that in the meantime, the data is recoverable. Anybody who uses simple recovery software may be able to see your Kik conversations. Luckily, there is a way to permanently delete your Kik history using a special tool. There’s a really good privacy tool out there called iMyFone Umate Pro iPhone Eraser or Mac version. 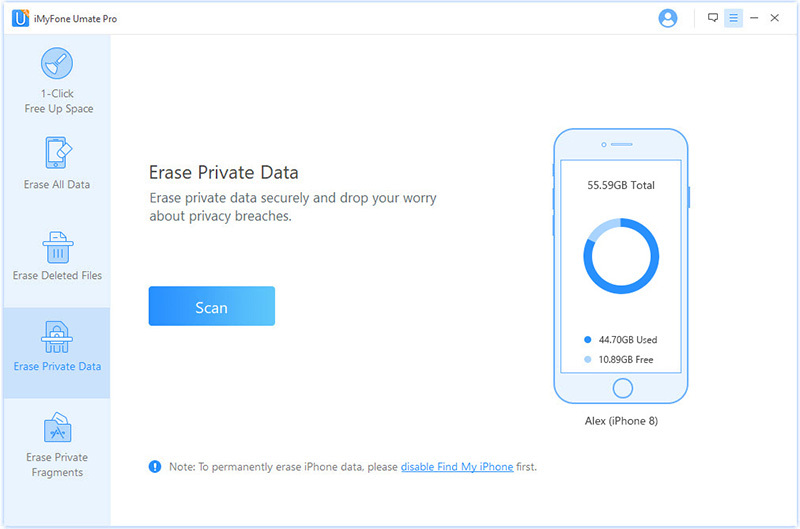 It can permanently delete data on your iPhone so that it’s 100% unrecoverable, even by hackers. It overwrites your private data with scrambled information so that it is impossible to decipher. Umate Pro is also very easy to use and you simply install it to your computer and plug in your iPhone to scan for private files for free. Preview and select private data to erase: Kik history, WhatsApp data, messages, contacts, call logs, notes, photos , videos, etc. Erase deleted Kik files that you thought you had removed manually, but that can still be found on your iPhone. Delete private fragments that apps like Kik, Snapchat, WhatsApp, Facebook, Twitter, etc might leave behind. Clear Kik cache and all app cache for free. Step 1: Download Umate Pro and install it on your computer. Connect your iPhone to your computer’s USB port. Step 2: Open up Umate Pro and click where it says Erase Private Data on the sidebar. Click Scan so that the software can scan your iPhone. Step 3: When it is done scanning, it will present you with the private data on your iPhone from various apps. Select your Kik data and click Erase Now. It is important to delete your private data when you can, and manual deletion is just not enough. If you have private conversations on Kik, use Umate Pro to permanently delete them so that they are unrecoverable, even by hackers or other snoops.